Berean Prison Ministry: Doing Time 10 He's in the Pods! This is the 10th installment of Spark's notes as chaplain at the Peoria County Jail. This is also the last of what he gave me so if you know Spark and want to hear more start hounding him for more stories. I'm sure there are thousands of stories. Only about 100 of the approximately 400 men at the Peoria county jail are allowed to attend the church services on Sunday morning. The jail allows us to send approved volunteers back to the pods that are not allowed to attend so that we can have a Bible study in the pod. A pod consists of about 14 cells in a 2 story room with about 3 round tables on the first level. After the guard lets us in we invite anyone that's interested to come and sit around one of the tables. Amy times we only get a few that will come down to the table at the start, but when you start reading, the Word draws them with their questions and thoughts. Sometimes it's hard to get out when it's time to leave. There are one-way glass windows on the second level where the guards can observe the pods. I was nervous the first time I went back in the pods. When it was time to leave the door didn't open and no guard came to let me out. All kinds of thoughts go through your mind when you think about where you are and who you're with. One of the inmates said, "we'll get you out." Now I'm thinking " will this be legal?" He and some of the other inmates take their shoes off and start throwing them at the one-way glass. Sure enough, eventually the electric lock on the door clicks and I'm out. My brother-in-law had an interesting experience in the pod that he told me about. Fedi decided to go into the work release pod one Sunday to see if anyone was there. There was only one inmate there and he was playing darts. (work release has more amenities than the regular pods) The inmate told Fedi "My god is what ever makes me happy at the time." He told Fedi that he had played darts competitively and that's what he wanted to do now. Fedi, who had played darts only about 3 times in his life, asked him if he wanted to play a game and that if Fedi won they would have a Bible study. The inmate said, "you're on". After Fedi had beat him so badly, (three bull's eyes), and the inmate found out that he had only payed darts 3 times in his life, he asked Fedi how this could be. Fedi told him that he had prayed first and told God that if God wanted this inmate to hear the word He would have to help Fedi win. They had a good Bible study. Below are a few letters that came in on Wednesday. In this first letter, there are capital letters where ever this prisoner thinks they are important and no capital letters where he believes they are not. Sir Could you Please Send me a Large Print Bible. and any other Books that will help me grow Spiritually. any thing on faith or Concerning the Spirit of God. I don't Read anything Worldly. such Books an't Spiritual I will Not Read. your help in this Matter is Really Needed. without Christ Jesus as the Center of My life, Life is defeated, so daily I surrender my will to him. My Walk is a Walk of faith, Not sight, feelings or my emotions. So if you Could Please give me favor before you as I have of God through Christ Jesus Luke 2-52. to be in Prison I am free Spiritually! the Word says if the Son sets you free, you are free indeed So I am free. I will be released from Jefferson county Jail and going back home on Feb 6th, 2015. I have served my time and have learned a lot about Jesus, The Father, and myself during the past 6 months of lock-up and I want to thank yall for the lessons and keeping me grounded in the Word of God. I would like to continue these lessons while at home and continue to learn more about the Word through your help. If it's possible can you send my next lessons to my home address. Please and Thank you! The next letter came as a response to one of our many many graders. Hi, Hope this finds you in good health and happeness. I got the lesson that you graded and I got the this one. I love doing these I have leared so much through these Bible lesson's. You ask me if I went by the name Bad and the answer is yes. Tell Bad Rad hi and I am praying for him and his mother and father. It really feels great to get small letters from people. I reall don't have nobody out there that wrights. The one's that are still here do not write. I learn a lot from these studies but most of all I get to meet wonderful sisters and brothers in Christ. Thank you for letting God work through you to uplift me with these special words. May God Bless you all. ps I could not tell what your name is. I am including the letter because I will be getting out in a few weeks, but I would like to complete my lessons and receive my certificate. I've just completed lesson 44. Is there any way possible that I could still complete my lessons when I get out? I really would like to finish, especially since I am so close to finishing. I would dearly appreciate it. I don't like to start something and not finish my goal. Thanks very much for you very much for your consideration. I have really enjoyed doing these Bible studies. They have really changed me and my way of thinking. I am sorry it took me so long to send back these next lessonds. I have had a brain tumor operation and my brain was going down into my ear and I almost died. had to learn how to think a little bit all over again but now I am comeing back with Gods blessings and answeres to many many prayers. I look forward to finisking this corse because if I don't I will feel like I let the evil one win one and I'm not going to let that happen again. Thank you for your patience. I am stuck in jail for something I have not done. I have lost all people and things in my life. I do not have money to purchase a bible. I would like to learn more about how to help others so I can fullfill what it is God wants me to do here, so I can get out. and try to get my family back. Diane picked up Emily and I for our usual Thursday Berean work. We were joined by Eva Jean, Diane R, Tiffany, Rachel and Terren. All the mail today was just 1 day's worth of mail, just Wednesday's mail as Ellen didn't pick up today's. 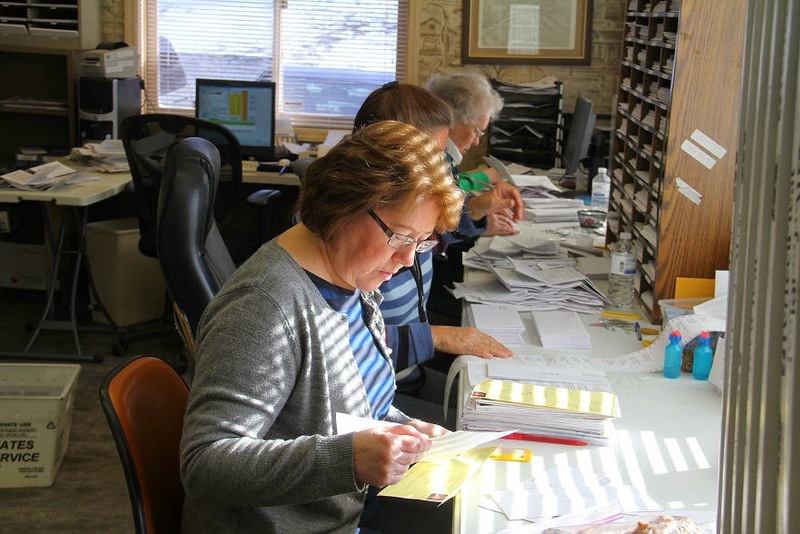 Below Tiffany and Rachel are working on Bibles while Terren is stamping our address on thousands of envelopes. 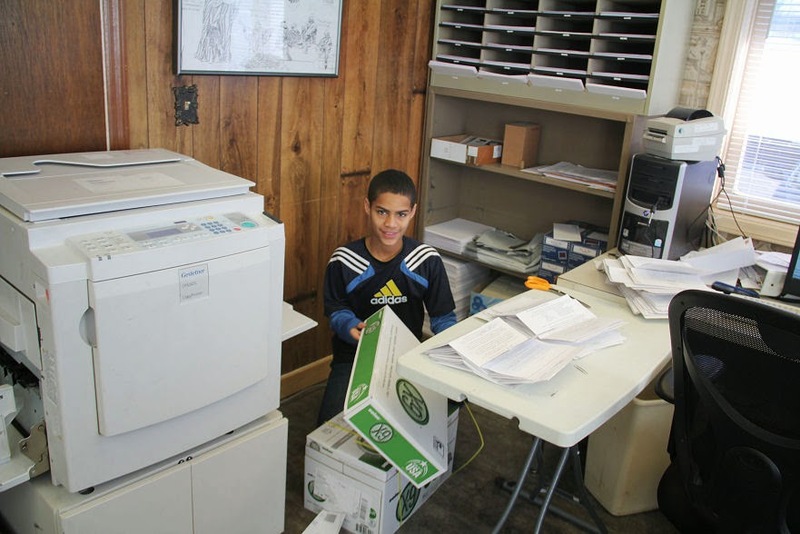 When he got 2 boxes finished Diane put him to work on opening copy paper. Diane kept that copier running none stop today. Below Diane R, Diane and Eva Jean are opening mail and reading letters. Emily helped for a while then started entering the studies on the computer. Once the labels are on the envelopes the studies are taken into the conference room to separate into the piles by number. The stuffing of the new studies are also done in that room. There were 8 of us working and all of us kept busy from 9:00 am to noon. We dropped off the Bibles at the post office and ate lunch at Tyroni's.